NASA’s Research and Technology Studies (RATS) team will conduct its 2012 events in two phases. 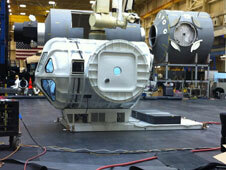 The first phase is further separated into two, three-day parts, conducted at Johnson Space Center’s (JSC) Building 9. A mock Multi-Mission Space Exploration Vehicle (MMSEV) is show in the "flying" configuration, mounted on an air sled, moving across the air-bearing floor. Phase 1 will take place Dec. 13-15, 2011, and Jan. 18-20, 2012. This phase will focus on determining functionality and habitability of the Multi-Mission Space Exploration Vehicle (MMSEV). The MMSEV has a flexible architecture, allowing it to rove on a planetary surface atop a wheeled chassis, or fly in space using advanced in-space propulsion systems. For three days and two nights during the Dec. and Jan. simulations, the two-person crews will eat, sleep, and exercise in the MMSEV cabin, housed in JSC Building 9. Throughout the day, they will trade responsibilities as EVA (extravehicular activity) and IV (intra-vehicular) crewmembers. During the EVAs, the crews will egress the vehicle through the suitports, then perform a variety of simulations that future crews could potentially conduct on a mission to a near-Earth asteroid. By executing Phase 1 at JSC, the RATS team is able to use a medley of tools and simulators that would be difficult to transport to a field test location. The Air Bearing Floor, for instance, is a key technology that will allow the crew to test the MMSEV in the “flying” configuration on an air sled, rather than as a rover on wheels. A virtual reality lab will provide an immersive environment for the EVA crewmembers, integrating real-time graphics with crewmember motions and kinesthetic sensations of large objects – an asteroid in this case. And the Active Response Gravity Offload System (ARGOS), a crane-based, reduced-gravity system, will allow crews to conduct activities in simulated microgravity.